Save a dollar off every beer, wine, soft drink, shot or cocktail you order at over 50 Orlando locations. Your card is valid for 30 days from your first day of use. You can also download the free companion app which makes finding locations a breeze! Everybody loves to save, especially when on vacation. The Dollar Off Drinks Card lets you do just that! What better way to save than not having to pay full price for each of your adult beverages? Whether it’s the infamous “Just One” or making an evening of it with family and friends, it’s always great to pay less for your drink than the person next to you! 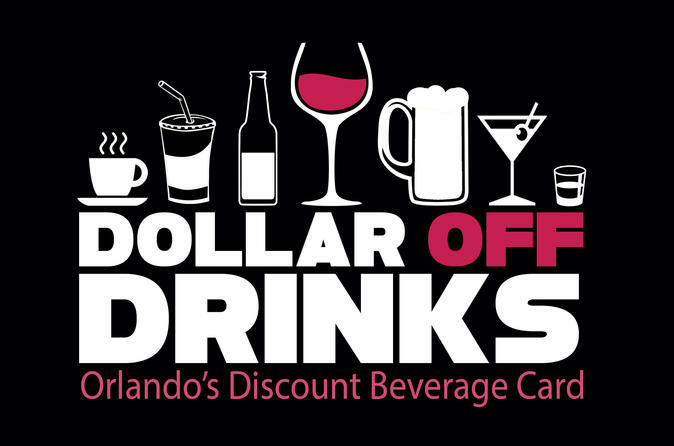 Save a dollar on every one of your drinks in over 50 venues in Orlando. Savings from the Dollar Off Drink Card makes your bank account a little happier so relax and extend your happy hour at some of Orlando's finest bars and restaurants. Keep that crisp dollar bill back in your wallet for next time. You can download the free companion app for you mobile device, and this will show you anywhere close where your card is accepted. Special Offer - Book and save 20% compared to the local supplier's prices! - Book Now! © 2019 Hello Orlando - All Rights Reserved.